Old time Grande Prairie hockey fans will remember defenseman Henning's patented end-to-end rushes that resulted in a goal or at least a successful "shoot in." The maneuver was based on Max's ability to pass the puck to himself using the boards as he rushed headlong, head down from end to end. It was a tactic he perfected on the natural ice in the old Wapiti Arena where he was a rink rat at age 12. Rink rats, equipped with scrapers, scoop and a sled-drawn fifty-gallon oil drum flooding apparatus, were the Zambonis of old. Rink rat service was rewarded with free admission to the hockey game. Rats were also goal judges, standing behind the net, signaling a goal with a raised hand and side stepping high shots. It was a dangerous role that rink rats relished as it was the best seat in the house and where they experienced excitement that comes while standing in the middle of scrums around the net. In the early years there was no minor hockey in the town of 600 but at age 15 Max played on a team coached by Charlie Turner, the Peace Country's "Mr. Hockey." For the occasional “away” games hockey parent, Bert Bessent, and car dealer, Jack Crummy, would provide transportation. Max was a pilot in the RCAFs Tactical Bomber Command from 1942 until the end of WW11. During that time, the only hockey he played was with the hometown boys when he was home on furlough. Hockey played an important role in the normalization process of post- war adjustment for Max and other veterans. Along with Bob Card, another ex-bomber pilot, Max organized the Grande Prairie Key Club to accommodate the hockey interests of returning veterans. Max was Team manager. From 1952-54 Max was player/manager of the revived pre-war Red Devils. In 1955 the colorful Red Devils team were re-named the Athletics that Max continued to support. Max’s leadership was central, to the evolution of senior hockey in Grande Prairie. Throughout the 50s, 60s and 70s, various organizations took advantage of Max's altruism and his interest in hockey. As a volunteer fire fighter, he spent many free hours flooding community rinks. He coached, managed and refereed midget and junior hockey teams and for a decade was chairman of the Arena Commission. He served on the organizing committee of the Centennial Provincial Midget Hockey Tournament, and served on a committee that conducted hockey exchanges to Anchorage, Alaska, and Japan. Max supported senior and minor hockey with proceeds from a concession at the arena that he operated, and as well, participated in fund-raising activities to support old-timer hockey in the city. Well-deserved honors presented to Max Henning include the Exemplary Service Medal from the Lieutenant Governor for 23 years of service as a volunteer fireman and the Queen's Golden Jubilee Award for decades of volunteer service to the community. Max Henning was a founding member of the Legends Committee and still serves in an honorary and advisory capacity. 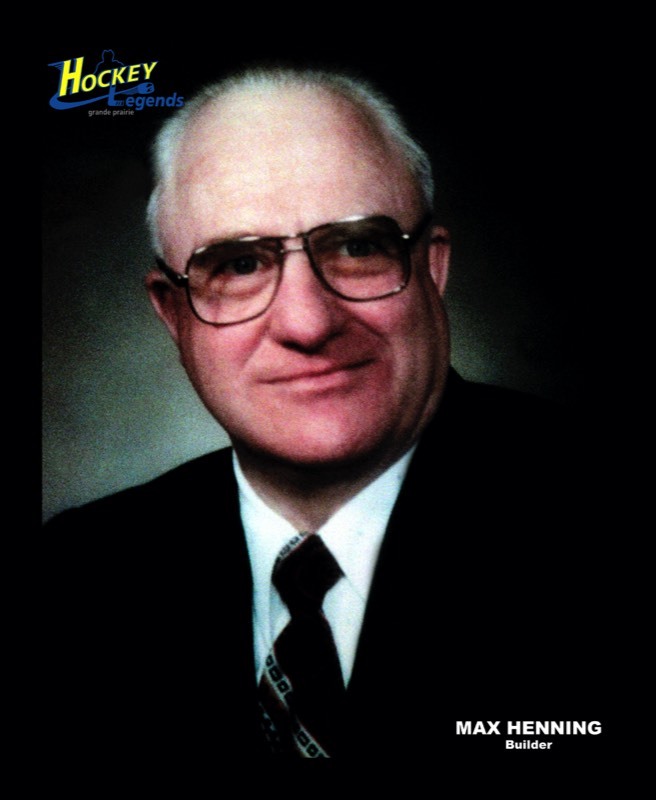 Max Henning - a Grande Prairie Hockey Legend in 2004.